This is the most recent information about Ludo that has been submitted to amIright. If we have more information about Ludo, then we provide a link to the section where it appears (the actual page whenever possible). "Hum Long" originally "Hum Along"
"Good Will Haunting By Myself" originally "Good Will Hunting By Myself"
"Good Pill Hunting By Myself" originally "Good Will Hunting By Myself"
"Good Wall Hunting By Myself" originally "Good Will Hunting By Myself"
"Good Kill Hunting By Myself" originally "Good Will Hunting By Myself"
Make sure you pronounce the "o" with a long-vowel sound. I died before the birth of Christ. I crashed before the birth of Christ. 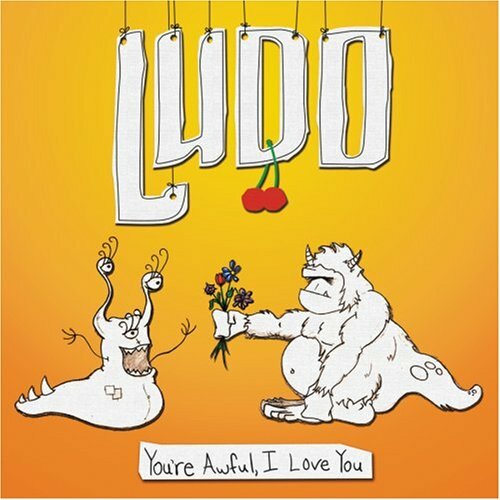 Once again Ludo has made a laugh-out-loud yet sweetly sentimental song that I would still enjoy even if I listened to it 7 times a day! "Good Will Hunting By Myself"
Always making fun of my clothes, telling me how hot other guys are, asking me to pay you gas money?! Yes, your a$$ did look fat in those jeans, your mom's a M.I.L.F. And I plan to get on your little sister just as soon as I give her a call back, oh and you know what else? Why don't you go watch it by yourself? Why should I watch Matt Damon cry without her at my side? The whole song about a man gone insane from grief & trying to find a way to bring his wife back to life is slightly scary... but I find this part about climbing into her grave to hold her bones and whatnot most grotesque/horrifying. "Human Log" originally "Hum Along"